Tried to make a gif today - let's see if this works? 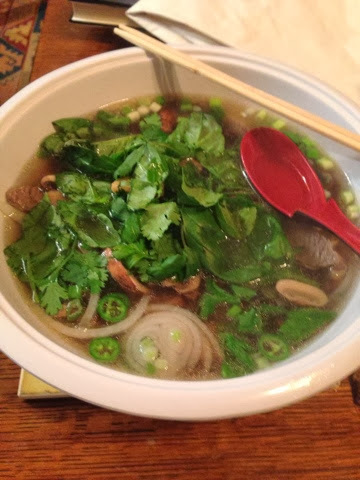 I love the Vietnamese soup called Pho. It's hearty and filling and is a healthy indulgence. I think I'll be making it much more in future. This is my second attempt, and I used a soup base from an Asian market instead of making entirely from scratch. The first batch I made was better, so I'll stick with that method. I LOVE peeling and cooking with fresh ginger- it's a glorious fragrance. Working like a fiend to try and organize my house before school starts in an attempt to hold on to any shreds of sanity I can muster. Rearranging furniture tonight with the gallant help of Himself. Hoping to have things orderly enough to make my cranapeno jam tomorrow. I owe you all a huge post on the excess of irons I have in the fire at the mo. Big difference now between a few weeks ago is that I'm crazed with too much to do but I'm gleeful rather than stressed. It's been a very productive weekend for organization. I plan to have my place much more settled within 36 hours. No pressure, right? 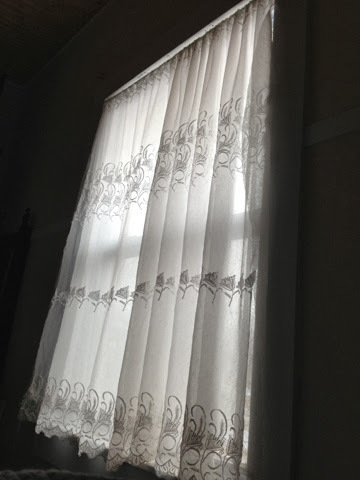 Today, I'm going to put a new sill in my kitchen window over the sink. This may turn out to be the ultimate in ethnic engineering. We shall see! If only they would fall! I've gotten a few pounds off the ground, but there appear to be many hundreds still clinging to their husks. They are delicious this year, too! The gorgeous song of love Zliey Dukhi translated from the original Russian, composed by Alexander Vertinsky, reminisces of the haunting nature of love lost so intrinsically tied to perfume. I adore Marc Almond, and this is perhaps my favorite recording of his achingly beautiful voice. This so embodies the ethereal yet riveting nature of perfume, yes? Well, it does for me, anyway. Nuit de Noel is an Oriental Floral fragrance launched by Parfums Caron in 1922. Top notes include rose, ylang ylang and jasmine, heart is sandalwood and oak moss, and bass notes are musk (synthetic, almost always, these days) and amber. NdN has about it the air of an antiquated fragrance at first. The descriptor "old lady perfume" is one hotly debated amongst fragrophiles, and many a topic thread has been deleted from perfumista boards because the discussion became so contentious. We are creatures of habit and we follow trends in the herd-- it is known. "Old lady" is a poor descriptor, because today's 20 something co-eds will smell like little old ladies to coeds in 40 years when they wear their Juicy Couture or Fruitbomb trendies. It's a cycle. What you find new and fresh now will one day be a reminder of yesteryear. Very fine and compelling formulations may fall to the wayside, but some among their ranks endure, and only for the very good reason that enough of a market remains passionate about that perfume through the years. That said, there is an air of Grand Dame about Nuit de Noel. The person who demands instant gratification will not likely be satisfied with this scent, and I have to say I very nearly gave up on it before it revealed its full magic, and this would have been my loss. The opening is rather harsh and loud. Jasmine can be a tough sell for me, and ylang ylang can be overpowering, so coupled with the rose the opening is a bit cloying and borders on too much bang with not enough ooh-la-la! I urge anyone trying this to wait out the opening. For me, the dry-down takes at least an hour, and then there is the hot, racing heart of oakmoss and sandalwood to ground the high-flying florals and rein them in superbly. Finally, the base of amber is always wonderful for me, and though musks can be overly powdery to my nose, in this one it really works. Perfumes very much evoke moods for me, and none moreso than antique formulations such as this one. I can't put on a perfume from 1922 without thinking of the tenor and tone of that glorious jazz age. Girls with too-short skirts, rouged knees, brazenly bobbed hair and too too too much lipstick! Scandalous! This was the sparkling moment of Gerswhin, Stravinsky, Jolson. The world was in a big hurry to have too much fun, too soon, the dark perils of The Great War now shrinking in the rearview mirror. Now was a moment to marvel at the flickering image of moving pictures, to marvel at radio and be entranced as the sinuous lines of art nouveau morphed into the sleek form of art deco. It's all so jazzy, baby! So modern. So new. The link I've provided above is to the impeccable fragrance shop Lucky Scent. I can't recommend them enough for their wonderful service and superb selection. The site includes an expensive parfum but I use the eau de toilette and don't find it lacking in any way. I would like to have the parfum, one day, though. The great thing about Lucky Scent is that a sample may be purchased for just a few dollars, so you don't have to commit to a full bottle to try it out. This doesn't remotely resemble my Christmas family gatherings, but I love the song! American civilization and our media greet most things out-of-the-norm with a wide-eyed fawning veracity these days. They fall all over themselves to find common ground for mainstream America with people flogging their Islamic/Buddhist/whatever beliefs. They give unblinking respect to the yoga-plex for all the meditative mantras etc that would have been labeled utter kookville a handful of years ago. At the very least, these things would have been presented with a raised eyebrow, but now they are well-enough regarded to the point that they are brought under the big tent of political correctness. Even the new religion of Environmentalism is cited in newscasts with awe and reverence. I don't agree with all these things, but I do agree with respecting people who want a peaceful life that does not encroach upon the freedoms of others. They get to believe what they want, as do I. Given the above statements, why is it then a problem if a man publicly states his religious, political and social views? Why would a production company filming his daily life for a television show edit out "Jesus Christ" and "God" from the recording when these things come up in the course of this person's normal day, whether or not the cameras are rolling? Why would that production company presume to predicate their continued work with this man on him keeping his mouth shut about what he believes? Of course, any production company can (and usually does) engineer cuts of what goes on in these "reality" shows to portray the subjects in a particular light, but the folks on Duck Dynasty have been completely transparent about their views and beliefs, and for one of the people in that show to be thrown out of the production for expressing his views is patently wrong. Why should he cork his views for the sake of the opinions/lifestyles of people wholly unrelated to him or his family? THEY were guests in his home, at his sufferance, and not vice-versa. As far as homosexuality, this discussion will not lead to anyone changing their minds about which side of that fence they plant their flag. What this should lead us to is a resolution that we all do have to get along, and free Americans have the right to say and believe as they choose. We are none of us guaranteed a right to not be offended. Maybe Duck Dynasty guy was offended by decades of media and culture that fly in the face of his most sacred and profound beliefs? Maybe he got fed up and decided to exercise his God-given right (or his right as an American, if you don't believe in God) to say whatever he wants. Let me be clear: I'm not speaking about any particular thing he said, but simply about his right to say it. I'm not saying he didn't say outrageous things, but again: free speech. Freedom of speech is something we should treasure and fiercely protect. If this man can be shut up, so can you. The classic Dizzy Gillespie composition featuring the man himself along with Charles Mingus, Charlie Parker, Max Roach and Bud Powell from a performance in 1953 at Massey Hall in Toronto. Imagine a smoky room shot through with the electric energy of such brilliant, exacting musicians conjuring such felicity of sound from inanimate objects. Warlocks, they were. This is magic. This may not be to everyone's taste, but the brilliance is undeniable. It must be a wiener dog thing, but Mochi tends to sit side-saddle with such short legs and such a long body. Here we see her mid-munch on a pecan. 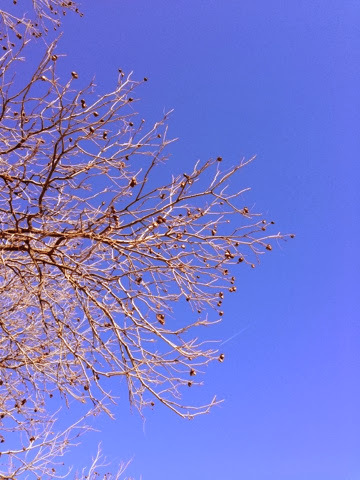 I think she's eaten more pecans than I've been able to pick up this year. It's not quite 2PM, and I've line- dried 2 loads of laundry and a third load is on the clothesline, and now I'm on my way to see The Hobbit for some well-earned recreation. It's about 60 degrees here and is forecast for 60s/70s for the next several days. Good time to get things cleaned out. I've been working on some creative projects and organizing. Today, I finally organized a schoolbook cubby, so now they have their own designated spot when not in use. I seem unable to let horizontal surfaces remain free of clutter, and things descend into chaos quite quickly-- the book cubby will keep these high-priority materials organized and readily accessible(once in November I nearly bought a second copy of a book for a course when I couldn't find the original. Stress!). The only hope for my sanity is to get my house more organized before the new semester starts in 4 weeks. It feels so good not to be freaking out about looming deadlines for tests and assignments for a change! Most pop music is incredibly unchallenging and tonically similar to other pop music. It's basically a bunch of re-treads. Most pop songs are built on a chord progression of the I, V, vi and IV chords. We're sort of trained from infancy to find this progression pleasing, and by golly! it IS pleasing, but it does mean that pop music rarely really stretches its legs and gives us something dazzlingly different. The brilliant troupe Four Chords has put together a collage of a whole bunch of music you know and possibly love, but that are so incredibly similar as to be interchangeable. Some of the segues are dazzling, so watch closely. Oh, and a bit of potty language near the end, so may not be safe for kids, though in my own very mature way, I'm going to be singing the phrase with the f*bomb for days. Just inside my head, though, and not publicly. I had my maxillary osteotomy. It's amazing how quickly this year has flown, but I was in a fog for months after the surgery. You can't have any idea of how much it takes to recover from a 7+ hour session of general anaesthesia until you actually go through it. I figured I'd bounce back much more lightly than I did, but I'm glad I did that and that it's behind me. Total quality of life is improved for having a proper bite, having the deviated septum repaired and also not having the constant earache from the jaw misalignment. Any one of these issues would have been justification enough to go through the procedure and recovery, but to have them all done is such an improvement. I've said so before, but I'll say again if you have a deviated septum and breathing issues because of it, you really should have the surgery to correct it-- it's amazing what a huge difference it makes being able to breathe clearly through your nose as you were meant to do. I'm feeling better, and still dealing with the cough that comes with post-nasal drip. Occasionally I'll have extraordinary coughing fits. I remember last year being rather bummed because my surgery and its aftermath would make me unable to see the Hobbit at or around the time of its premiere, and now the cough is something that will keep me out of the theatre, unless it clears up dramatically and quite soon. I'm trying gradually to collect more pecans in the yard, but I'm taking it in baby steps. I call that redneck yoga, much like picking up brass at the range. I get tired quickly, though. Old music is the sweetest. When I was a girl, we mostly lived in the mid-South (Memphis) area and on many weekends and always at holidays we'd make the trek up to the Ozarks to visit the folks. Mom and Dad often played old-timey radio for the drive, and this being the 60s/70s, that meant golden age of radio music like Benny Goodman, Bing Crosby and the like. In that gloriously analog world, you'd sometimes hear the crackle as the needle lovingly slid down the spiraling groove of the record. For this reason, great classics from the 1930s-50s radio seem so right for cold weather. THAT feels like a holiday to me. It doesn't have to be Bing singing White Christmas-- pretty much any Duke Ellington or Doris Day will work to evoke that warmth for me, and it's all just toe-tapping, good-feeling music. This is one I remember from those drives with the bayou along one side of the road as the terrain morphed from flat farmland to the gently rolling hills, and finally into the proper mountains. Sometimes there would be snow, but it was always cold, and at the time I was bemused by my old-timey folks and their predilection for the old music- that was just Mom and Dad. Still is, thank goodness-- I wouldn't trade it! This year's fancies are passing fancies, but the old-fashioned way is here to stay in my heart and always will be. I'm thankful for the early exposure to off-the-trending path in music so I'd have a greater appreciation for life. Nice to know some things are unchangingly wonderful. So relieved this semester is over, and I appear to have passed everything, so *whew* 4 more semesters to go, so two years from now, I'll nearly be a Nursie! Yay! Lingering brutal cough is keeping me up nights. Went to the dr today and my BP is ossum - 118/72 - and it's a great indicator of how stressful school has been, because I've had it taken many times in class, and it's mostly been higher than that. This is about normal for me for all my adult life, so I'm relieved to see it go down, but I'm concerned that it's been so affected by the stress of school. I need to get my mud in a ball so I can cope a little better. Dr gave me a prescription for a medicine that will hopefully help with this fiendish cough so I can get some rest and get on with my goals for down-time. I'm working on some creative pursuits, but mostly staying indoors while its still so cold. I have a CPR class on Monday, and then I'm good for the rest of the year. Yay! Hope you're all warm, well and enjoying the holidays. I'm hopeful I'll feel up to making some jalapeño jelly this weekend, and I'm overdue to make a batch of cranapeno jam-- I'm plumb out of the stuff, so the timing is good! True story. My Fam health assessment final is in about 20 min. Big pressure. Stood in line at the coffee bar and at the last second felt queasy and took a bottled water instead. Say with classmates doing a quick chat-survey of test elements, when suddenly I knew I needed a bathroom for a rather rude event. "I don't know who you are. I don't know what you came for. But what have is a certain set of skills." Apparently she was just checking her look in the mirror and cleared out quickly so I could, uh, let go. I suppose part of being a nurse means that you sometimes have to do your business on the fly and with or without an audience. Still, one prefers privacy for those *ahem* contemplative moments. My thought is that between the baby and geriatric years wherein one needs assistance to varying degrees, at no time is one more alone than when doing potty business. Incidentally, it becomes the time most likely to contemplate one's mortality. I can understand why dudes allegedly spend that time fiddling with themselves-- more pleasant than thinking of going into That Dark Night, whether gently or otherwise. This place stinks. I've gotta get out of here. ...aaaaaand I passed. Pulled a squeaker for this semester. Don't ever want to cut it this close again, but I'm relieved I won't have to repeat this class, because that's seemed a genuine possibility. Praline only grudgingly wears a sweater when it gets very cold. 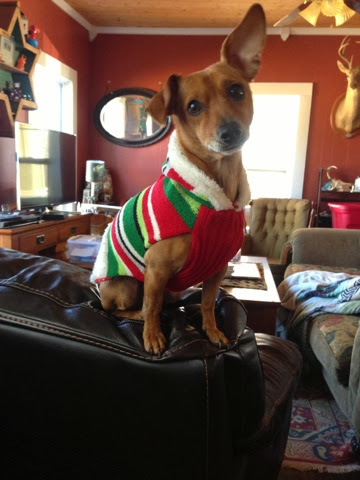 Chuy loves his sweaters as he is a dapper fellow, and would look right with a tobacco pipe and a snifter of brandy and bowtie. In the past few days Mochi has discovered she can stand the warmth-giving comfort of a sweater after all. Caught them snuggled up this afternoon, to my delight. 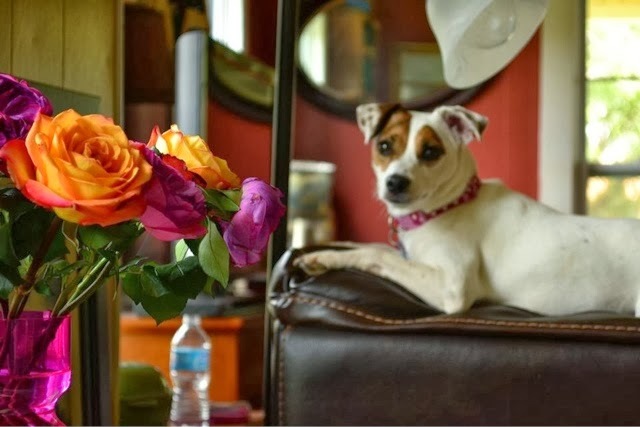 Pretty pretty Praline as photographed by the lovely Jennifer a few months ago. My ideal goof-off weekend is a long weekend with a well stocked kitchen and no need to leave the house. Id have time for cleaning and working on creative projects and my presence would be required nowhere else. In that way, this frozen over weekend has been perfect. Except that I'm achy and miserable. I just got into bed and I'm wondering if sleep on the recliner would be wiser, because I suddenly can't breathe through my nose. Yuck. At least I have cleaned a little and worked on some projects. I'd like to feel slightly less miserable, though. Everything is frozen here. I'm sick-- seems to be the flu this time. In bed all day, aching and dozing with puppies. Yet again I am grateful to Mom and Dad for the electric blanket which is making me much less miserable. Hopefully I'll feel more human tomorrow, but until then, I'm staying in bed where it's warm. Passed my Practicum yesterday. Not by a long shot, but by a comfortable enough margin NOT to call it a squeaker. I had my Intro To Nursing test scheduled for today, but a winter storm came barreling through the area and university classes were scheduled as of 30 minutes before my class was to begin. I suppose they'll have to reschedule for next week. I have my HESI on Monday, which I dread. At the end of the Practicum, the nurse gave me some tips for prepping for that, so I will spend some hours in preparation, as challenging as that may be. Meanwhile, my house is a wreck and I'm trying to get my feathers smoothed from the extraordinary stress I've been under. I was almost to campus today when I received an auto text notifying me of cancellation of classes. Stopped by the market and bought a small turkey, some wine and ice cream-- all the essentials. I hope to tackle some of the chaos in my house and get things a little better sorted on the home front. We shall see. It's very tempting to just snuggle up with the pups. 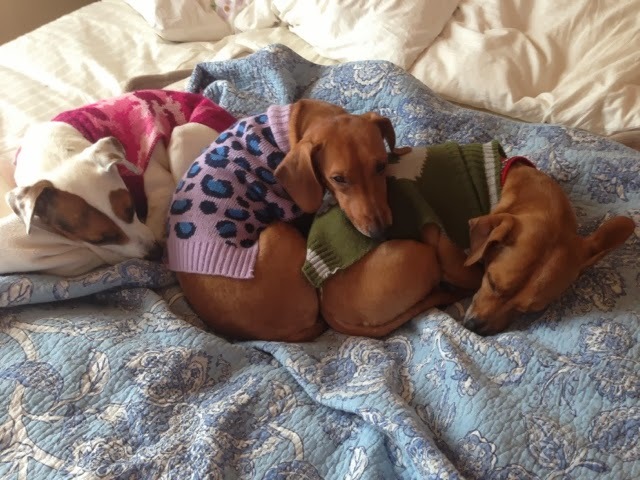 I've got the materials to make them each a little quilted jacket, so I'll probably have all three of them snugged up to my but while I embroider for hours at a time. I may stop for naps. I'll definitely be drinking a lot of coffee and tea. I'll probably run through the whole of my True Blood and Game Of Thrones DVDs. There will probably be at least one playing of Tombstone. When I'm not listening/watching favorite DVDs, I'll be listening to my Pandora channel which I call "If It Ain't Baroque" which features lots of Telemann and oodles other wonderful instrumentals of the Baroque era. I'm thinking of dipping back a little earlier with some Purcell and Anonymous 4. We shall see. Ready for a snug long winter weekend all house-bound, and no end of projects to kill the time. I sort of need this-- I'm wrung out from a grueling semester. I'm scared of the possibility of having any more stressful time in school - I'm hoping this is the worst of it, because this is wearing me out! Above all, there shall be much cuddling of the puppies. They need it, and I need it. Glad to be home, safe and snug, and I'm glad that for the next glorious 4 days, there is nowhere but here that I have to be. Sweet peace. 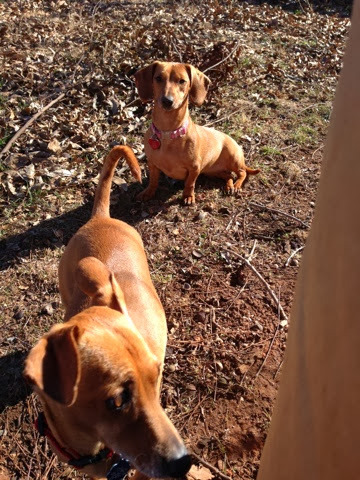 Consider for a moment the majestic splendour of a 16# weenie dog running through the house and sliding for about 8 feet. Sorry, it happens too fast for me to get a camera on the action. Mochi is hilarious as she chases her siblings, miles of ear-leather real estate flapping gaily as she otter-lopes through the house. She is the embodiment of joy, I think. 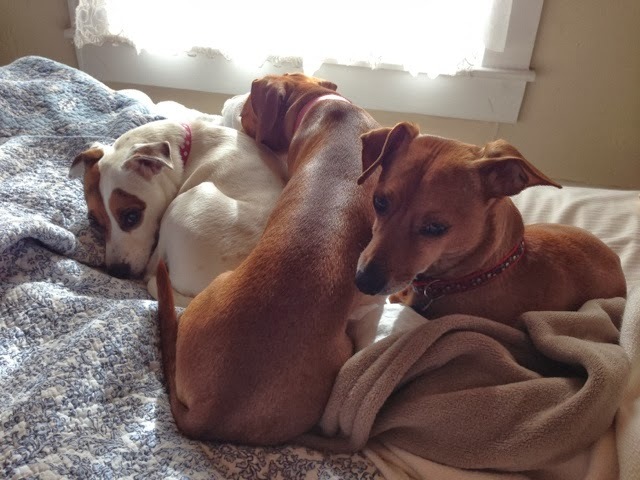 Speaking of, the pups have given me a great deal of joy and comfort in general, and in particular in the past several months. Himself aptly stated that the volume of information presented in Nursing school would best be likened to drinking water from a fire hydrant. Indeed. The sheer volume of material is daunting, to say the least. I'm trying to get the house in order, and last night I started an arty sort of project. I have about 5 major projects back-burnered, so it was good to get my hands dirty with something purely creative last night. 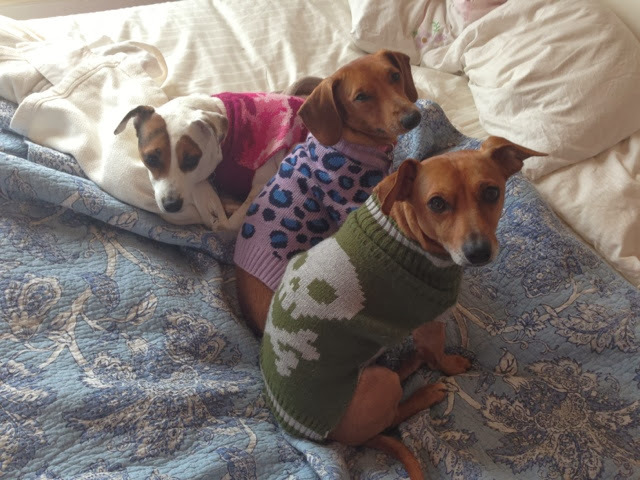 I also need to sew some little doggie jackets for the pups, for Winter is coming. Tonight is my Pathophysiology final. I feel somewhat ready for that, but not too concerned. More of a worry is my Practicum which is tomorrow afternoon. My lab partner has flaked out on all previous attempts to meet and rehearse our practicum, so I'll be meeting with someone else today. I also made an appointment with lab partner, but I expect her not to show up. Flake. I want this thing over with, but I want to do as well as possible, too. She's been very difficult, so it's been frustrating to say the least. I had nearly 100% average, so my middling showing on the final dragged my average down to 89%, and I'm fine with that. Now for the ritual killing of the text book. December 1 update, much to tell. To say the past 14 weeks of school have been grueling would be to understate. This week I have three final exams and my practicum, and next week is the HESI exam. The Pathophysiology Tuesday is in the bag-- I only have to make a 10 of 100 on the final to earn the minimum score required for the RN program for the course, so pressure is off on that one. Tomorrow morning the Data Analysis final opens and I'll do a review of materials and then take the test early to get that behind me quickly. Intro to Nursing exam is Thursday, and my Practicum is Wednesday afternoon. I plan to exhaust all study time between now and Wednesday with preparing for the practicum. It's amazing how important rehearsal seems in this case. I feel cautiously optimistic. Still much woodshedding to be done, but this is eminently doable. I'm meeting with my lab partner today to review practicum details, and I want to get some metrics memorized (her number of teeth and fillings, among other things-- she doesn't have a full set) so things will move more quickly at time of practicum. I have to score 112 in order to pass, and I've already earned 9, so I have to hit 103 of 141 remaining points. Piece of cake, right? I quit the job at the salt mine at the end of October. The work itself was easy, but there were huge stressors that came with, plus the hour or so of the day that involved driving/gas money, it was producing too much drag on an already overburdened system. Leaving was the sensible way forward, and I don't know how I would have endured the madness of the past 5 weeks at school if I'd been still dealing with the stress from that job - so glad I moved along. Back in March, when recovering from my surgery, I began a job search in earnest. Changes were happening quickly with my workplace and I knew that I'd want to move along, but only in a sensible and deliberate fashion. I could have taken a job at a nearby large hospital, but the managers expressed concern that I would find that job too challenging to do part time when I was in the throes of stress with RN school. I acquiesced to their wisdom, as I may work with them in future as an RN and don't want to burn my bridges early. One job I applied for early in the year was dispatcher at the local small PD a few blocks from my house. They went with another candidate, but called me out of the blue several weeks ago and asked if I'm still interested in part time work. I vexed over this - I'd already made the choice to try and make ends meet, and I think it would have worked, but I'll admit the lack of a trickle income has been a bit of a challenge. (witness my shock at having recently found Top Ramen noodles at my local market for 2/.79!) This town is small and they get very few genuine 9-1-1 calls, so it is quiet a goodly portion of the day. I will be able to study at work. Let me repeat: I can study at work. That sort of tipped the scales for me. Study at home can be challenging, depending how needy Chuy is being at any particular moment. I'm thinking this may be the best possible move for me at this point. I'll have a minimum of 8 hours per week, but most weeks that will be all I do. Sometimes I'll fill in for others who are out, but they've committed to not having me work on Monday or Tuesday, which are my heavy school days. The department is low-key and I already have a friend who works there, so I think this is an all-around good fit for me. I'll be 3 blocks from the pups all day, and Himself will be doing puppy-daddy routine, so all my baby ducks will be in a row. I can't believe how this year has flown. In truth, the most devastating thing about the surgery in December(besides being pitiful and helpless for a few weeks afterward) was the general fog I was in for at least 6 or 7 months afterward, perhaps more. This has been a difficult year in a great many ways, but it's been immensely rewarding. I am so pleased I had the surgery, in spite of the after-effects, and I'm glad I didn't wait a minute longer - that's the kind of thing that's easier for a young person to recover from, I'm convinced. Just like college - it's for the young, too. I'm grateful for all the good things going on, and again I'll say I'm cautiously optimistic about things. If all goes well, two years from today I'll be composing a post saying that I'm a couple of weeks from finishing RN school, and that is dazzling to consider. Two years seems like a long time and yet, just 11 months ago I wrote that I felt I was about to swim across an ocean. Well, I'm a third of a way across, so, yippee. It's going to keep getting better. Sunday, Puppy Sunday: puppy hugs! 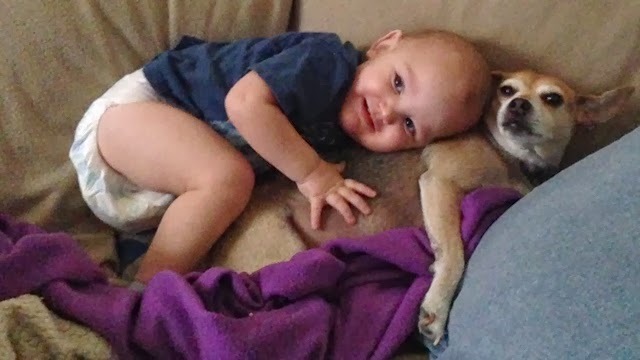 My little nephew with puppy Dog!